This giant cupcake cake is made with the a Wilton cupcake shaped pan but we've given directions below on how to make it without one. It is a great cake to decorate because it is so versatile. Prepare a double batch of cake batter or two box mixes. You will have a little leftover to use for cupcakes. Fill the giant cupcake pan about 2/3 full. Bake 40-50 minutes until a toothpick inserted in the middle comes out clean. Place on a cooling rack in the pan for 30 minutes. Turn upside down on the cooling rack and allow to cool several hours or overnight before adding a crumb coat and decorating. Trim off edges if necessary. Add a thin layer of buttercream frosting, this is called crumb coating. Allow to sit several hours. Now decorate as you'd like. 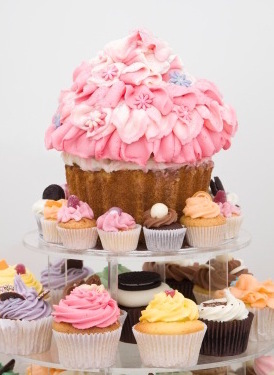 Frost your giant cupcake and add sprinkles or round candies on the top. Frost the bottom with vertical lines to look like a real cupcake liner. 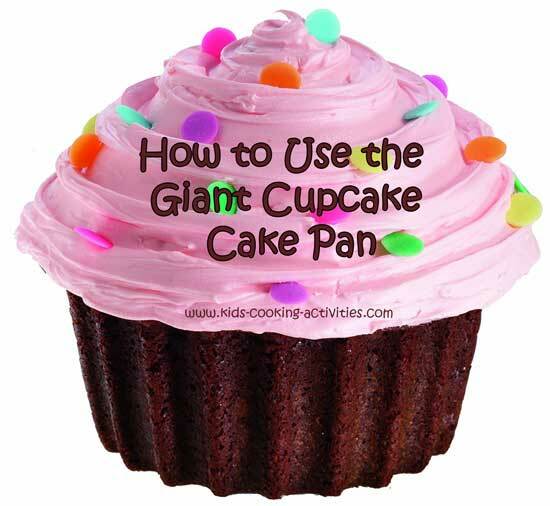 You can make your own giant cupcake by layering 3-4 circle layers. 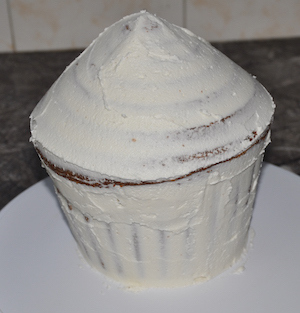 Carve the sides narrower at the bottom in the shape of your cupcake. 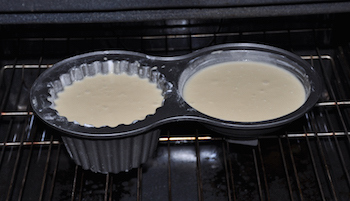 Add a round cake baked in a ball pan or batter bowl on the top. Decorate.